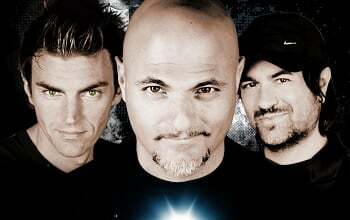 Eiffel 65 is an Italian three-piece Eurodance group formed in 1998 and best known for pioneering in pitch correction and Auto-Tune, and for their international hit ”BLUE (DA BA DEE)”. Their other hit singles include ”MOVE YOUR BODY” and ”TOO MUCH OF HEAVEN”, all of which appeared on their album EUROPOP, released in late 1999. Blue and their other singles, have soon achieved an amazing success worldwide, obtaining the first place in the best selling charts for several weeks all over the world and making Eiffel 65 one of the most successful 90’s artists ever, getting a triple Platinum in the U.S.A., a Diamond record in France, a triple Platinum in Germany, UK and Austria and the World Music Award in Montecarlo for Best Selling Italian Group and also a Grammy Award nominee for Best Dance Artsis. Their first Album “Europop” peaked in the top five on the Billboard 200, was at the top of the MuchMusic countdown, and sold over two million units. ”Blue (Da Ba Dee)” peaked at #6 on the Billboard charts.